So opens Charles Dickens famous book - A Tale of Two Cities - about life in 18th century England and France. Sometimes it feels like Pittsburgh sports can be a tale of two cities - one set of rules apply to the Steelers and Penguins and then an entirely different set of rules apply to the Pirates. No where can the dichotomy of these different rules and standards be more glaring than in comparing the treatment of Penguins head coach Dan Bylsma and Pirates manager Clint Hurdle. Entering this season, Pirates skipper Clint Hurdle had one winning season out of three at the helm of the Pirates. One post-season appearance - last year - after two consecutive years of historic collapses by the Pirates and a career record of 245 wins against 241 losses. Compare Hurdle's record to that of Dan Byslma. In his time at the helm of the Penguins, Bylsma, to date, has compiled a record of 251 win against 117 losses and 30 overtime losses. Bylsma has taken the Penguins to the playoffs in each year he has been head coach (this year will be his 6th) and he has won a Stanley Cup. Hurdle just got a 3-year extension while Bylsma, unless he makes a deep run in the playoffs, could find his head on the chopping block. 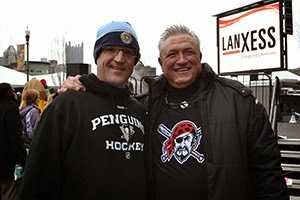 Hurdle is lauded by Pirates fans as a savior, while Bylsma's every move is questioned by Pens fans. Pirates fans would be happy if Hurdle just kept the Pirates respectable, Pens fans wont be happy until Bylsma wins another Cup - and even then who knows how long another Cup win would buy him. As a Pirates fan and a Pens fan I most certainly get this double standard. Clint Hurdle took my beloved Pirates from the laughing stock of baseball to the post-season promised land in just three years. While Bylsma inherited a team that had gone to a Stanley Cup finals the year before and was stocked full of talent. I get that expectations are and should be different considering where these teams have been, but I write this piece as a cautionary tale. The Pirates weren't always the laughing stock of baseball, they were a proud franchise with 5 World Series rings and a team that had been to three consecutive National League Championship series before embarking on a 20 year losing streak. And the mighty Penguins haven't always been the mighty Penguins, this is the same franchise that filed for bankruptcy, almost moved to Kansas City, and stock-piled today's talent on the backs of high draft picks awarded thanks to years of dreadful win-loss records. Things change. While it seems impossible today to imagine the Crosby/Malkin/Neal Penguins ever becoming an NHL doormat, it was equally as hard to imagine that the early 90s Pirates of Bonds/Bonilla/Van Slyke would embark on a 20 year losing streak. I don't know whether Dan Bylsma will return next season, and if the Penguins fall short in their Stanley Cup run again - particularly if they exit the playoffs early - I am not sure whether Bylsma should be back. But I do know one thing, Pens fans should savor this moment, this team and this coach while it lasts. You never know what the future might bring.